Calorie Cloud’s Workplace Activity Challenge is a 30-day corporate wellness program that converts calories burned by employees into life-saving nutrition for severely malnourish kids. It’s the only corporate wellness program that saves lives, that I’ve heard of. Pretty awesome right. Calorie Cloud works with employers to create a 30-day activity challenge for their employees. During the challenge, employees and teams calories are tracked and converted to RUTF packets, which are sent to severely malnourished kids. To-date, nearly 17,000 lives have been saved. 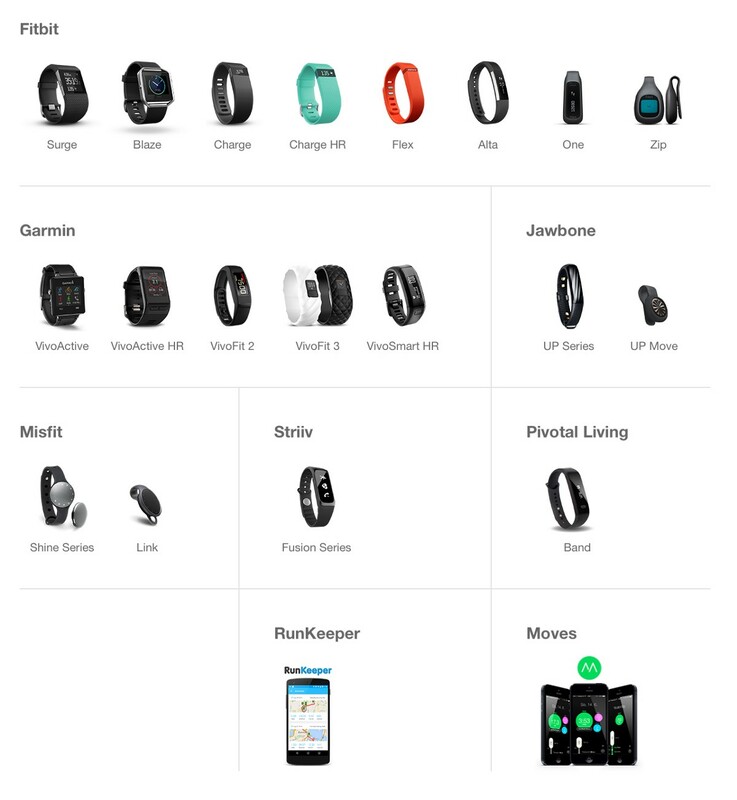 Calorie Cloud’s custom-built activity platform can use calorie data from over 100 fitness devices and apps, including Apple, FitBit, Garmin, Jawbone, Misfit, Nike and Strava. Employers don’t have to purchase a tracker, but they often prefer to as a part of their offering to employees. Calorie Cloud works closely with employers such as Johnson & Johnson, JPMorgan Chase, Time Warner Cable and Janssen to roll out 30-day wellness programs that match their corporate brand and tone. Calorie Cloud’s product is a uniquely researched and refined experience—not just a technical platform or web-app. The experience is the product, and it’s been designed to work in many common and existing scenarios. 86% of employees surveyed in our pilot programs said that they were more active when they knew it was helping someone else at the same time. Calorie Cloud is partnered with Mana Nutrition—an American manufacturer of Ready-to-Use Theraputic Food packets, or RUTF. These specially-formulated packets are endorsed by the World Health Organization as the most effective way to treat Severe Acute Malnutrition (SAM). At any given time, it’s estimated that about 20 million kids are suffering from SAM. 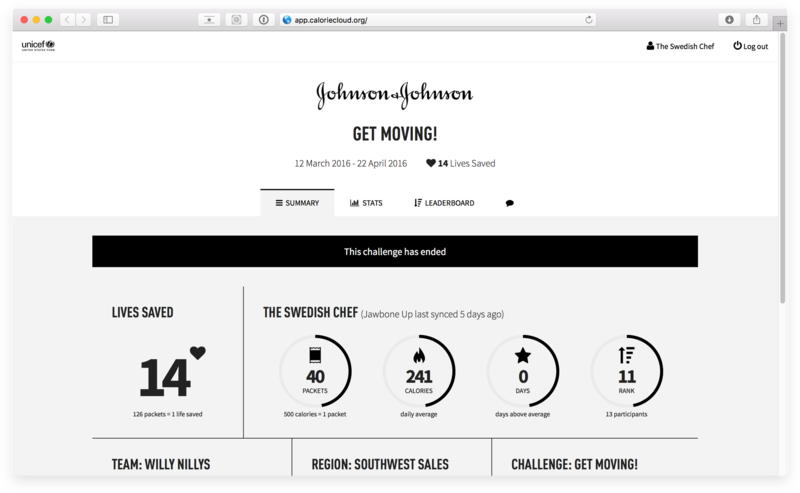 To-date, Calorie Cloud’s Workplace Activity Challenge has saved almost 17,000 lives. Employers can choose the rate at which they sponsor calories. Some choose a 1:1 ratio, while others choose a 2:1 or higher ratio. So if employees burn enough calories for 500 RUTF packets, then 1,000 or more are sent to kids suffering from SAM. Employers only pay for the impact they have. If an organization already uses another wellness platform, Calorie Cloud’s Workplace Activity Challenge can work within it to have the same impact. That’s because the goal is not to get as many people as possible onto Calorie Cloud’s platform, but to save as many lives as possible. Calorie Cloud’s technical platform supplies the back-end architecture and front-end communication data during challenges. Because the platform is largely manufacturer-agnostic, nearly any activity tracker or tracking software can be used as a data source. The primary experience is all about the impact. Employees receive notifications when they, or their team, has reached a milestone (in addition to the typical onboarding and reporting emails). These communication campaigns work within the company’s timeframe, are customized to their tone, and are fully branded. At any time, an employee can access their team’s Dashboard via a web-app. This Dashboard supplies customized, live data about the participant’s progress, as well as the progress of their team. A leaderboard encourages friendly competition and secure messaging. In-addition, employers can use their Administrator’s Dashboard to push messages to their employees, a specific team or individual. During 2015 and 2016 I spent months with Workplace Activity Challenge’s Product Managers. 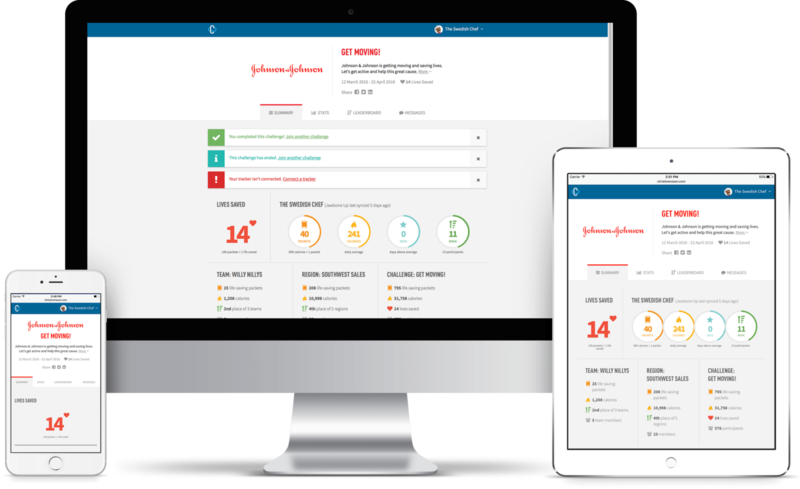 They had gathered years of data and experience while implementing the product from it’s initial Pilots through to large engagements with companies like Johnson & Johnson. The web-app and customer experiences had been iterated upon for some time, but with this treasure trove of experiential data, we dove in to extract and synthesize it into a behavior-driven, end-to-end experience for employers and employees. I led brainstorming sessions, card-sorting exercises and ‘sketch parties’ with the PMs both remotely and in-person in Boulder, Colorado to synthesize the feedback from employers and employees into clear and actionable outcomes. In some cases, this was a simple change to the web-app’s interface. 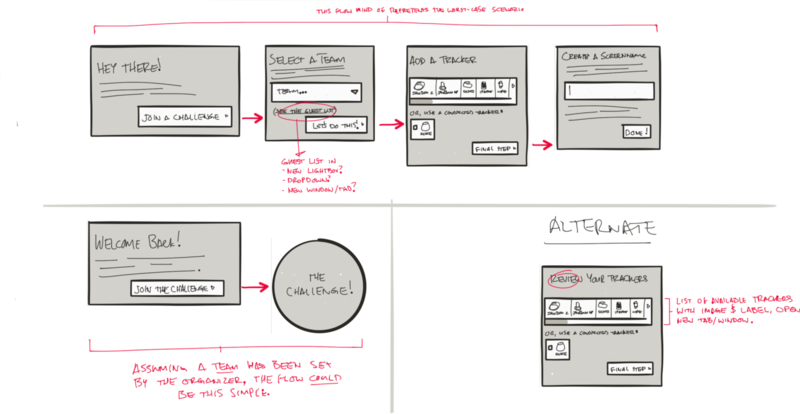 But in most cases, it meant writing new flows into two complex user journey maps for the employer and employees. The result was the cohesive end-to-end experience that exists today; an engaging, educational and social experience all based around how your personal activity is making a real difference in lives around the world. The core experience for the employees consists of a highly stragetic set of conditional and timed email campaigns. Each email relies of server-based activity data and a custom trigger criteria, which then generates custom, targeted infographics. Campaigns strategically drip-feed educational and encouraging stories about how RUTF is saving lives, and how they and their team have had an impact by that point during their 30-day challenge. I worked with PMs the create new email-friendly copy for all aspects of email stories and other communication, and then I designed the email templates using Adobe Photoshop. 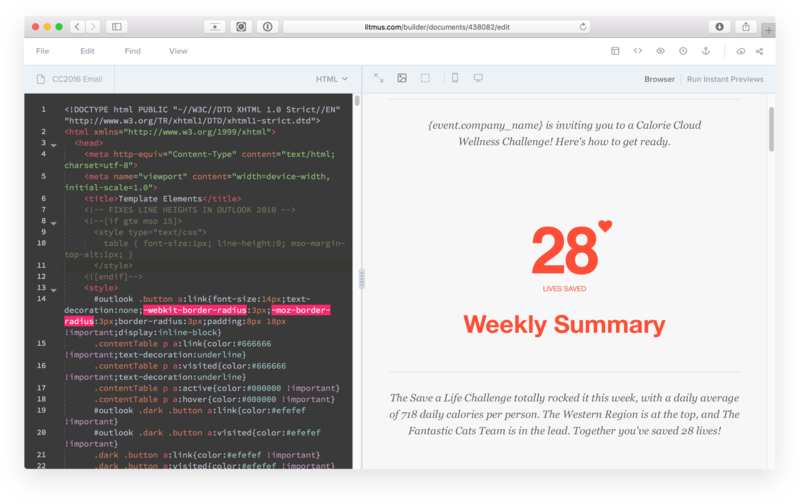 HTML emails need to work across a large combination of email client and operating system, in-addition to hundreds of display sizes and accessibility requirements. The emails were designed—from the beginning—with all of these constraints in-mind. I coded the emails from scratch for testing with Litmus and maintained pixel-perfect compliance down to a later version of Lotus Notes—because not all large organization are running the latest-and-greatest. I worked with developers to integrate Cloudinary’s server/client dynamic image delivery system. This ensures that recipients see images in the correct resolution for their combination of email client + device without wasting precious bandwidth. If you’re on an old desktop computer, you’ll likely get images at 72dpi (the old standard for web). On a new iPhone, for example, you’ll get up to three times that resolution so images always look crisp. I performed client and constituent research using a combination of Google Analytics, existing internal lists and publicly available market data to determine our need for accessibility support across these experiences. What I found was astonishing; nearly 80% of our mean demographic should have been using some form of assistive technology (even if that was only increasing font size), and yet only about 5.5% were. Not only should we code for total inclusivity, but we found that most of the common accessibility practices would supply real usability benefits for our majority of users not using assistive technology. There was simply no downside. Font sizes were increased, contrast was kept high and our photography and text color was subject to positive color-blindness tests. We found that our dedication to accessible technology tangibly increased the usability of our experience. I tested the accessibility of both the web-app and email code to ensure the highest compliance for modern assistive technologies, such as screen readers for the vision impaired. Testing was conducted on both the web-app and the emails using the three most popular 3rd-party screen readers, plus VoiceOver (Mac/iOS) and Narrator (Windows). Automated tests for readability, color and contrast were performed to meet our self-set 90th percentile requirement. Our user-centric and design-led approach enabled an agile and iterative process to market with our re-vamped experience. After the initial user-research & ideation stages, working closely with the development team to employ accessible technologies allowed us to code for accessibility right from the start. The synthsized research enabled the best UX Writing approach within email communications because we internalized the daily rigors of employee environments. Communications were kept clear and strictly followed a run/jog/walk pattern. 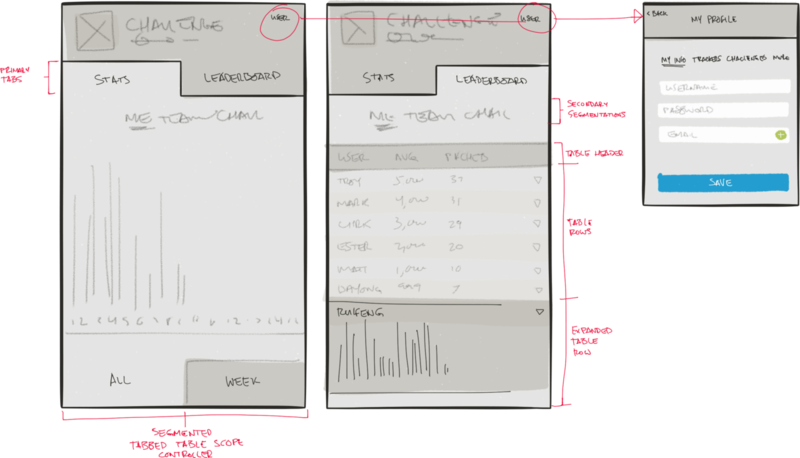 A new Information Architecture allowed us to prioritize every piece of information based upon user feedback. We learned that blurring the lines between User Research, User Experience, Design and Development departments was the enabling factor for efficient iteration and testing. As a remote team, we collaborated using Slack, GitHub, PivotalTracker, Asana and Google Hangouts. These communication and organization tools gave as an asynchronous way to maintain velocity. Of course, every team is only as good as the skills and culture of its constituents, and I was honored to be a part of this project alongside the Product Managers and Development Team. Calorie Cloud’s life-saving platform is a fresh experience in the corporate wellness space. 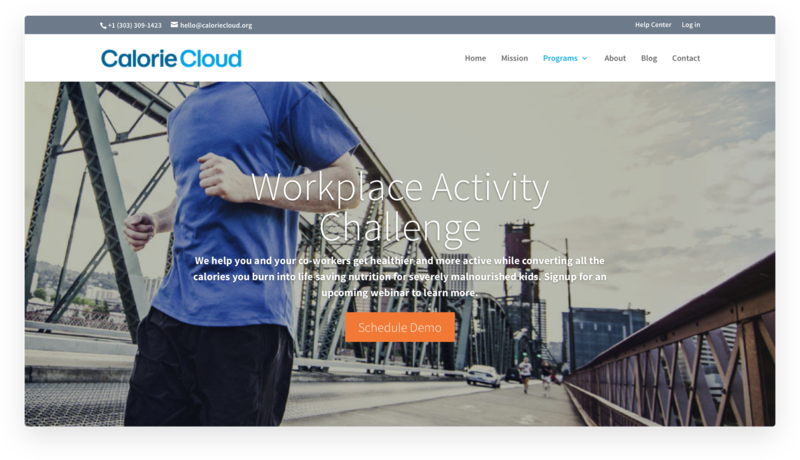 You can schedule a demo of Calorie Cloud’s Workplace Activity Challenge, or read more about it.